Dr. Bernanke noted that corporate earnings have risen at the same time; he believes corporate earnings will continue to grow and “catch up” to asset prices. Obviously, given his track record, that is a chilling statement of contrarian purposes. Kidding aside, it is interesting that he of all people would feel comfortable enough in making such a claim. For one, that is exactly the market problem at the moment. It is priced for enormous growth, way out in front of actual earnings which for nearly three years now have failed $100 (for the S&P 500). 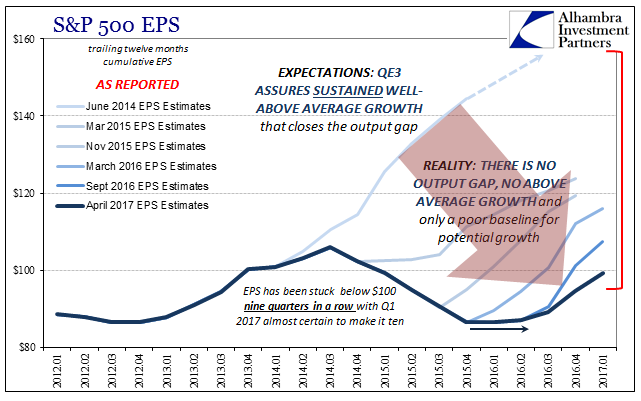 In order for EPS to “catch up” will require the kind of growth you actually find in a recovery, at the very least a short burst of intense activity that creates all the follow-on effects that he once talked about igniting through QE. But that isn’t what he actually said in his interview. 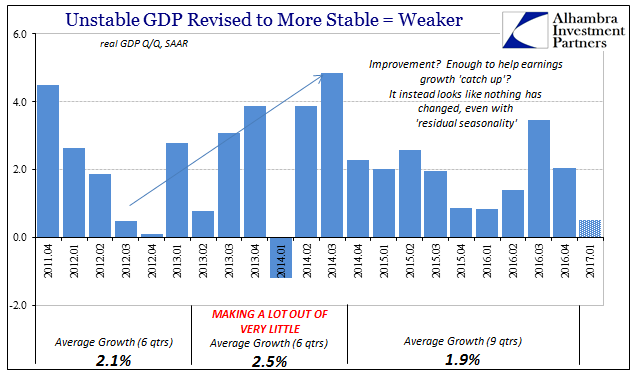 Like Janet Yellen, Bernanke sees only vague improvement, so unsure that he felt compelled to qualify it further. Again, there is truth to his statement, but it fails because it recognizes no standards for such relativity. Making the same statement in 1999 after the US experience with the Asian flu would have been impulsive and foolish; making the same with the global economy as it is in 2017 is a different world altogether. To begin with, being improved from early 2016 is no achievement or cause for celebration. 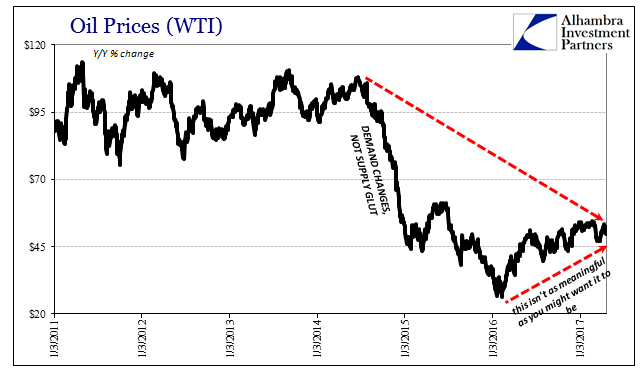 The history of oil prices and inflation really is instructive in this regard, and not just because of the energy sector’s effects on aggregate earnings; you can be enthused that oil is nearly double off the low last year, but you cannot forget or dismiss that it is still more than 50% below 2014. Up 80% in a year sounds like healing and the return of growth; down 50% three years later instead declares “something” still very wrong. 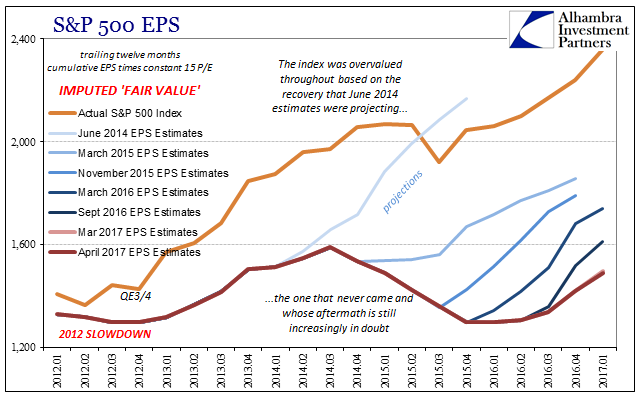 Thus, EPS is like other economic stats where improvement has occurred but only in the narrowest sense. What Bernanke and the media talk about is not what has transpired so far but extrapolating acceleration upward forever into the future. 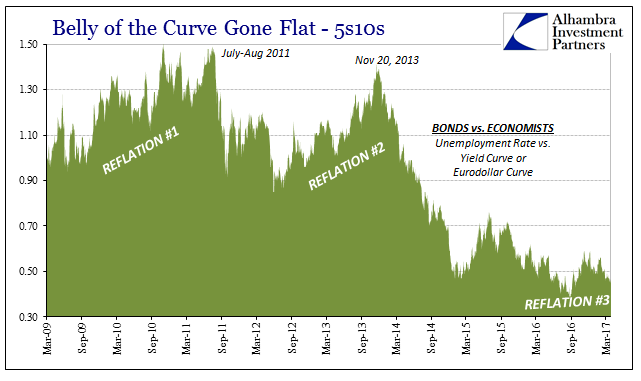 We’ve seen too many times over the last ten (twenty) years how doing so fails, including 2013-14; the bond market, by contrast, after 2011, gets that risks are enormously weighted downward for reasons of liquidity first of all. That, too, is in important factor because it was liquidity at the very least the QE’s were supposed to fix. 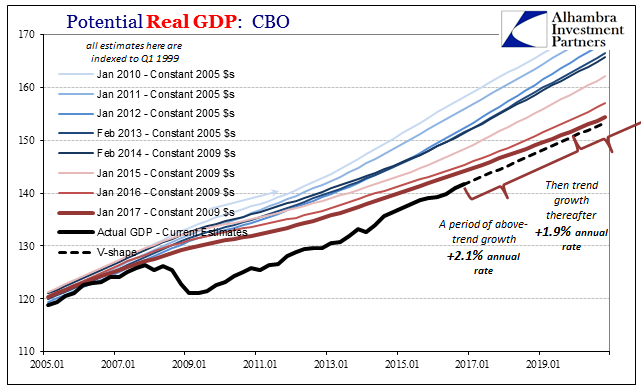 The path of balance sheet expansion into the real economy was always murky to begin with, no direct channel would ever exist between the purchase of MBS or UST into the wage rates of ordinary Americans. It was thought to work through expectations more than anything else. But the trillions of bank reserves, so-called money printing, surely would cure all financial liquidity risk. And yet, that is the most prominent feature of the financial landscape apart from the stock market. Everywhere you look there are expressed abnormal (for all history before 2007) liquidity preferences; from eurodollar futures to German federal paper the story is the same – persisting fear of illiquidity, “dollars” most of all. If Bernanke could not get even that right through four QE’s and $2.5 trillion in reserves, the one thing closest to what everyone assumed was this central bank’s wheelhouse, then his views on stocks are likely to be, again, contrarian. We need only briefly revisit the topic of “term premiums” to make this case especially after 2013. The only reason it still is “something of a puzzle” is because he [Bernanke] like the mainstream continues (to this day) to assume that QE works and even works well. 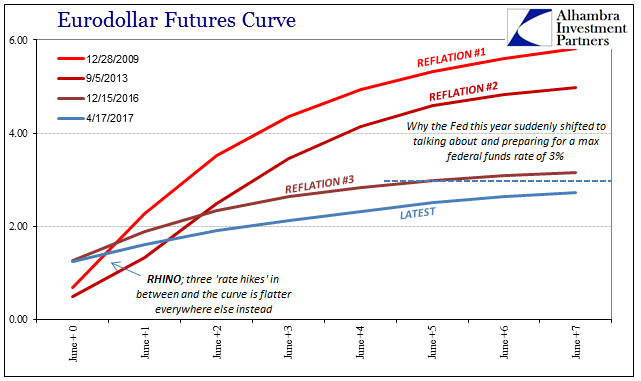 From the point of view of effective “money printing” the behavior of the bond market has been and remains a complete mystery. 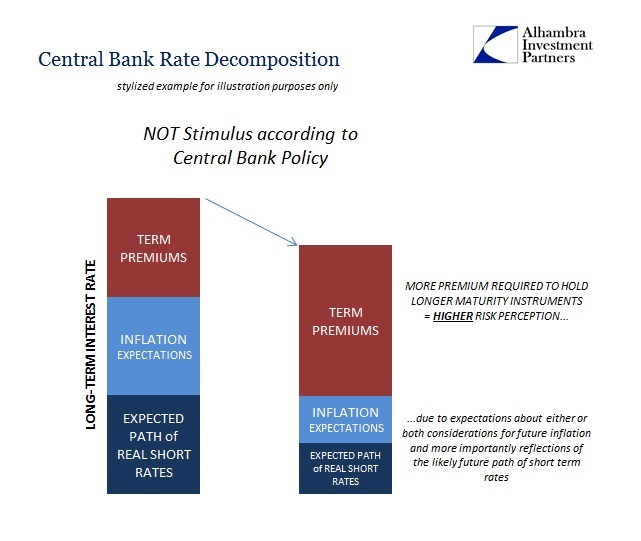 Again, to reconcile these two very different positions (QE is effective stimulus but nominal interest rates don’t show it) requires the imposition of lower “term premiums” though the reason for them cannot be explained. Economists have no answer for why interest rates, or the parts of the decomposition of interest rates they find useful for running regressions, fell more after QE than during it. There is a world of difference between thinking QE was successful via “term premiums” than realizing the bond market was right to suspect QE wasn’t much of anything. The former can lead back to normal growth and meaningful improvement; the latter will not, leaving stock investors pricing a Hail Mary. What we find is that Dr. Bernanke has had it backward in every case. Therefore, his assertion that earnings will “catch up” should terrify (perhaps a little strong) stock investors to their very core. Maybe this time he will get it right, blind squirrels and all, but who in their right mind wants to bet on that basis?